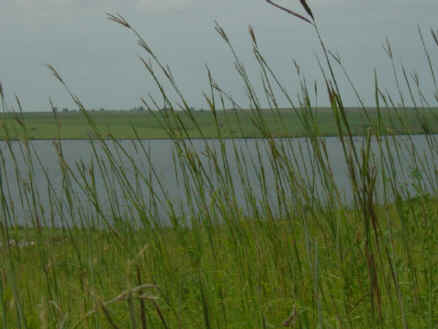 All photos by Jim Mason Surrounded by upland native grasses, Yates Center Reservoir is an excellent place to get the "open tallgrass prairie" feeling. Late spring and summer are the best times to view and photograph prairie wildflowers and birds. Commonly seen prairie birds include dickcissels, eastern meadowlarks, grasshopper sparrows, mourning doves, scissor-tailed flycatchers and red-tailed hawks. On occasion upland sandpipers and greater prairie chickens are sighted. 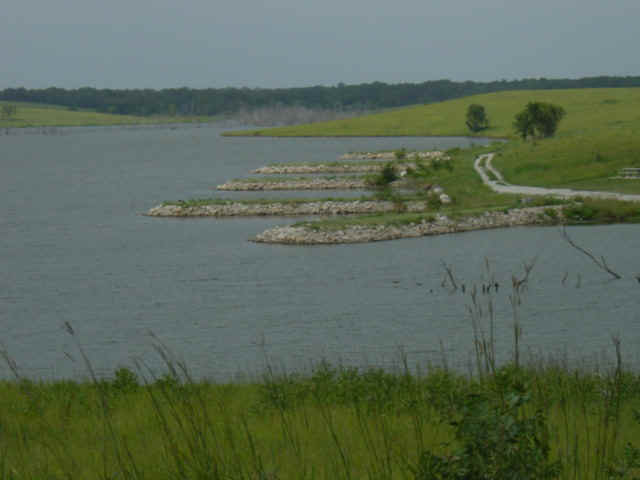 The lake attracts migrating waterfowl in spring and fall. If you visit in early spring, listen for western chorus frogs. In late spring and summer the deep bellow of a bullfrog is often heard. Basking on logs in the water are sliders and painted turtles. Primitive camping only. Permit required. Click the icon to find a birding list for Wilson County. Directions: From Yates Center (90 miles east of Wichita) travel west 4 miles on U.S. 54, then 2 miles south and 0.25 miles east (red arrow on map). There is no entry fee, but fees are required for fishing, boating, swimming, and camping.